What is the Heritage Society? The Heritage Society is a group of people who have made a direct gift to the Manitowoc-Two Rivers YMCA Endowment Fund or included the YMCA in their estate planning. Why is an Endowment Fund important? The simple answer is stability. The Endowment Fund provides support every year. It provides much needed revenue to enhance programs, grant scholarships, begin new programs and maintain or improve facilities. It ensures a stable source of income to guarantee that the YMCA can continue its mission for future generations. Through effective financial planning, you can minimize taxes and increase the amount available for your heirs. There are a number of philanthropic strategies that allow you to direct your wealth in ways that reflect your values and beliefs, provide important tax benefits and transfer wealth to succeeding generations in a tax-advantaged manner. Make an immediate donation and take a charitable deduction as provided by law. Include the YMCA in a will and reduce estate taxes. Fixed amounts, specific assets or percentages of the estate may be specified. Another option is to name the YMCA as the recipient of the remainder of an estate after all other expenses and specified contributions. Contribute appreciated assets, such as stock, real estate or personal property to the YMCA and receive a charitable deduction equal to the current value of the assets without capital gains tax. Purchase a life insurance policy naming the YMCA as the beneficiary, and take a charitable deduction equal to the premium amount. Several plans are available in which a new policy can be fully paid in a period of five to seven years. Establish a Charitable Remainder Trust and you receive an immediate, federal income tax deduction for the present value of the assets expected to pass to charity, plus a lifetime payment stream. Official Name: Young Men's Christian Association of Manitowoc, Wisconsin, Inc. Your name will become part of YMCA history as your name joins the names of other community visionaries on our beautiful recognition plaque in our facility. 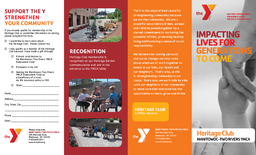 For more information or to inform the YMCA that you already qualify for Heritage Society Membership, please email Joe Metzen or contact via phone at 920.482.1529.